My husband is a very lucky man. Most men have to beg their wives to be able to give up days watching sports and barter to get ESPN turned on, but not my husband. I love sports, all sports. I willing watch ESPN, on my own, with no one forcing my. Name a sport, I’ll probably watch it. Baseball, yes. Basketball, yes. Hockey, yes. Golf, yes. Car racing, well, no. Hey even I have a line. Football, duh..of course! Reason number two he’s so lucky, about a year and a half ago, we decided to remodel our basement. Behold….The Kerry Cave. 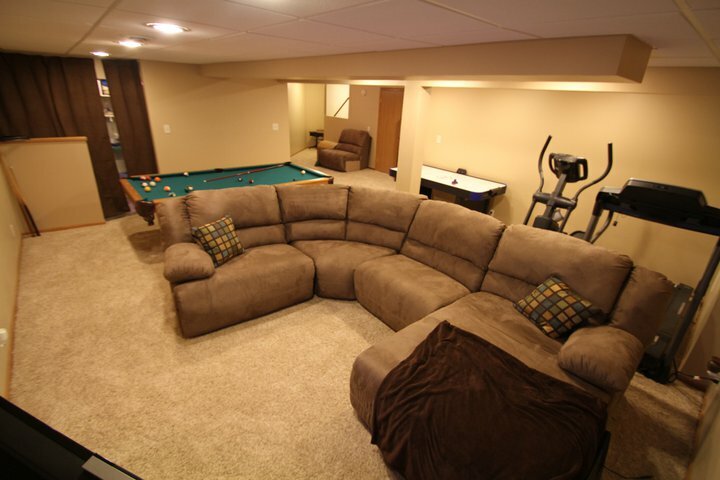 No, this is not a man cave, this is a Kerry Cave, because this was my creation, my dream football watching experience. Football, oh glorious football. Oh how I love thee. 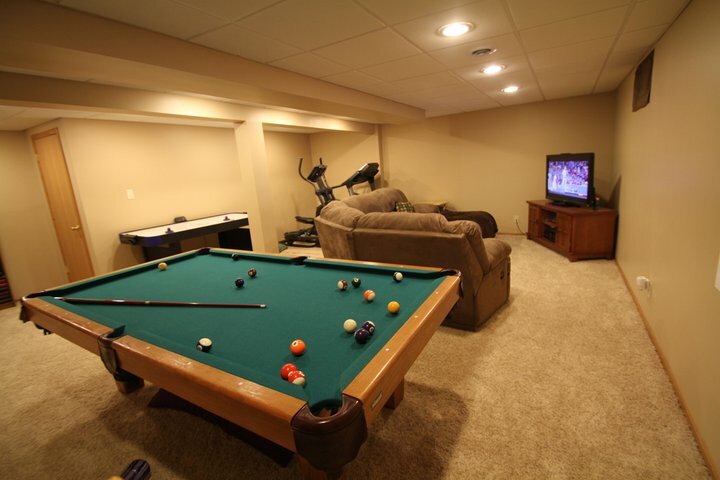 If it is fall and it’s a Saturday or Sunday, I will be holed up in my Kerry Cave watching the Nebraska Cornhuskers (GOOO BIIIIIG REEEED!) or my Green Bay Packers (GO PACK GO!) and any and every other game I can find. If there’s a game on, I’m watch it. 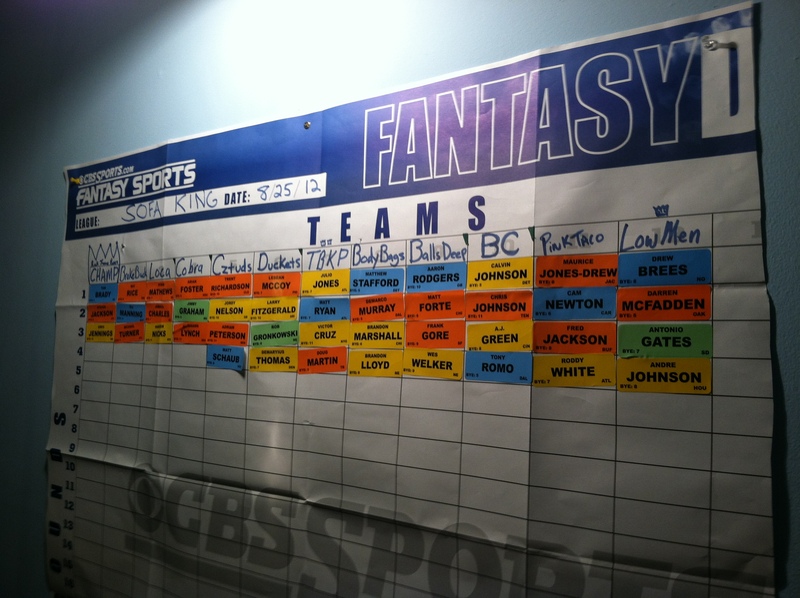 Due to my addition to football (admitting it is the first step), I inherited my husband’s fantasy football team. He joined a league with a bunch of his college and work buddies close to fifteen years ago and was thrilled to be relieved of it. He enjoys football, but the hassle of maintaining the league just wasn’t his thing. He frequently skipped the draft and ended up with a crappy, computer picked team. Then he would forget to set his roster and, without fail, play guys who were injured or on bye weeks. I think he did a happy dance when he handed over the reins. 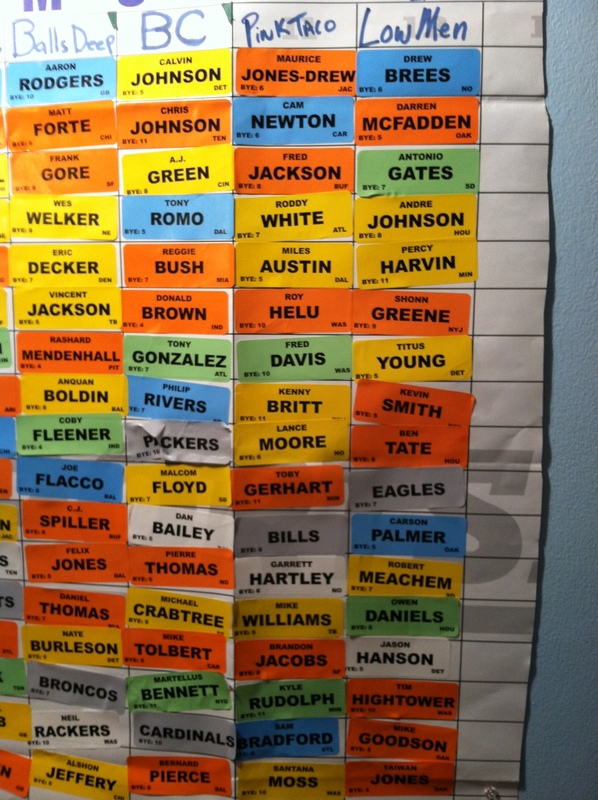 On draft night was last Saturday and I realized something, it’s a really a dirty minded little boy’s league, complete with raunchy names and all. The name of the league is SOFA KING. Get it??? Some of the team names are Tongue Bathing Katy Perry and Balls Deep. Wanting to fit in, I renamed my team. So what do you think??? Go Pink Taco Go! Has a nice umm, well, interesting ring to it! As I was driving to meet friends the other night, I looked at my clock and realized that I was a few minutes early. I parked and ran in. I found the ink right away. (Side bar…what is the difference between standard capacity and moderate capacity? Even the guy there didn’t know.) Just pick one. You know you’ll be back next week when the printer again refuses to print claiming to be out of ink. 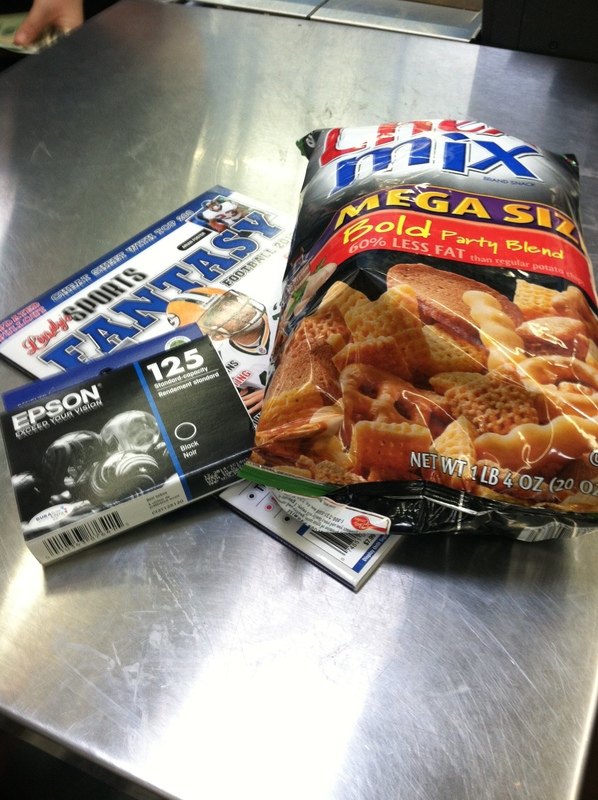 Oh Chex Mix! It wasn’t on the list, but Bold and Spicy is Yummy and Tasty, so in my arms it goes. Now it’s time to blow this popsicle stand, and I’m still ahead of schedule! Speedy checkout, here I come. And here I screech to a grinding halt. There is exactly one of four speedy checkouts actually open and a line is eight deep. I quickly scan the rest of the checkouts. Only two other ones are open, and they also have long lines plus over flowing carts. I take my place in the back. Maybe she really is speedy…. Um, no, not even close. 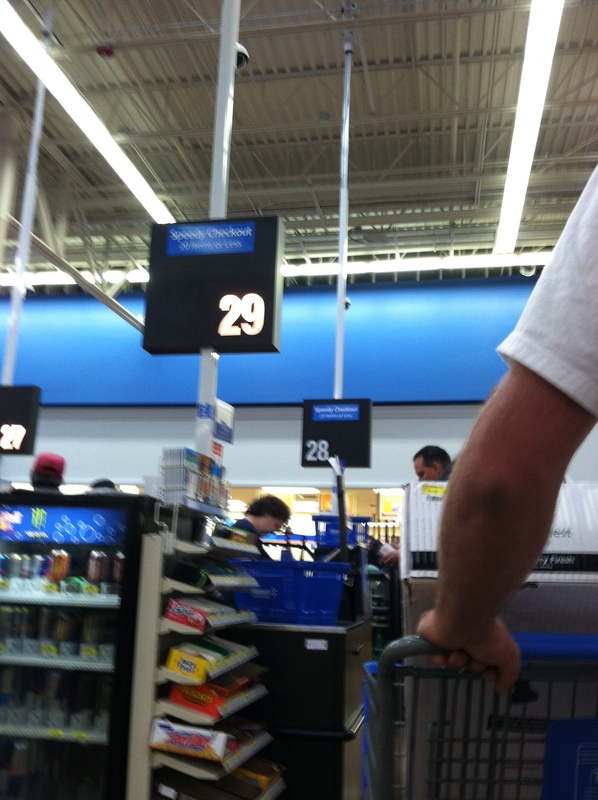 Do they purposely put the slowest cashiers in the speedy lane to teach us a lesson? They should add that scrunched up ‘Plan Ahead’ sign and pump laugh tracks through the sound system. Finally, I put my head down, defeated. Thank you Meth Cookers for ruining it for the rest of us! As I’ve mentioned before, I live with three allergy people. Spring and fall, while beautiful seasons on blooming buds and falling leaves, they are sheer misery for my fam. I mean look at this kid! He’s miserable. 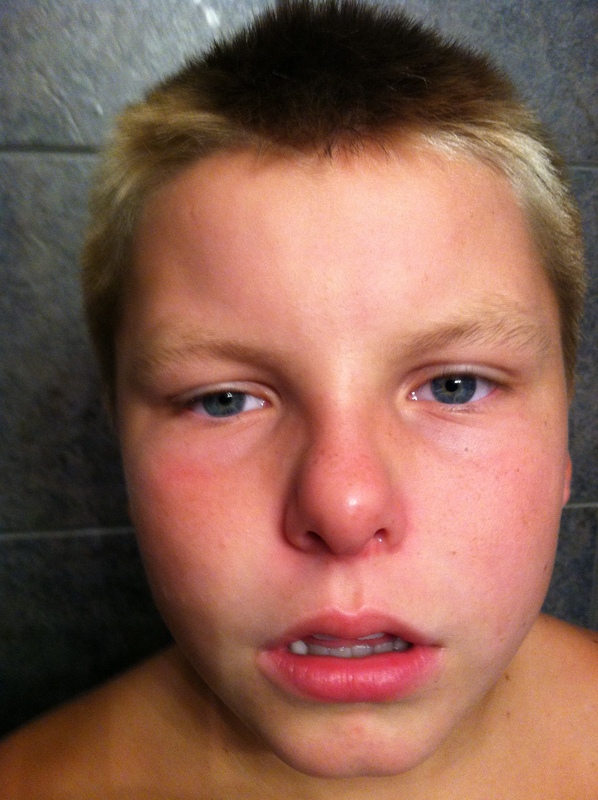 His head is stuffy. His throat is itchy. His ears hurt. His nose is red from all the blowing and running. 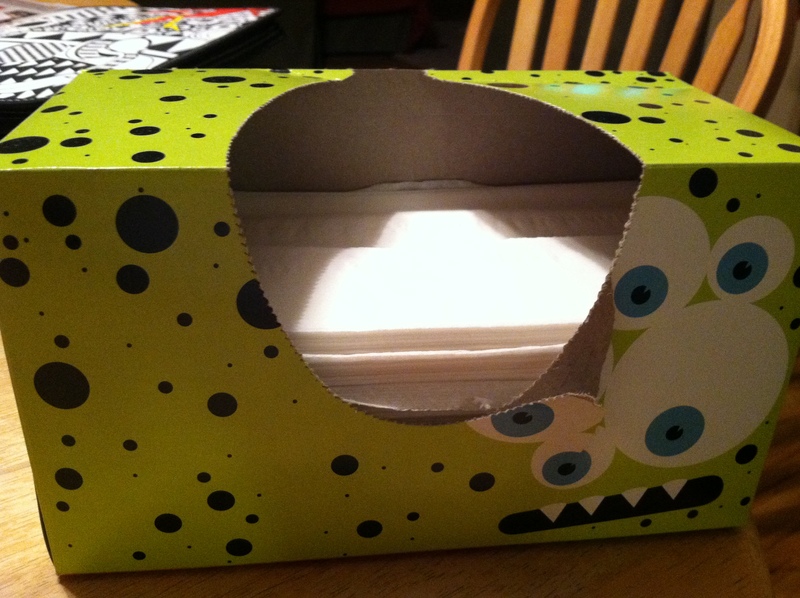 My kleenex bill is through the roof! This box was full three hours ago. Luckily for me, the FDA made Allegra-D an over the counter med, saving my a $60 c0-pay and an afternoon at the doc being told my son has allergies. Unluckily for me, pseudophedrine is a meth cooker’s best friend and now we are all treated like criminals when we are trying to end our families’ misery. I found my section…all the paper slips, but no boxes of meds. The good stuff is kept hidden behind the counter. With my final decision in hand, I approached the check out, ID ready, smile plastered on my face to help me look sweet and innocent. The cashier scans my ID and my potential purposes. Then the register starts making noises. Cashier and pharmacist exchange a private look. Great, I’m now marked. There is probably a swat team defending on my house as we speak. Good thing it’s not Wednesday. If they break in and find my husband watching Breaking Bad, and we will never talk our way out of this one…. You know those nice, crisp fall days when you get to open all the windows of the house and let the breeze blow through. Must be nice, because I don’t. I would kill to get to let the fresh air enter my house. Unfortunately I live with three people who are allergic to nearly everything that grows outside. Grass, weeds, pollen, mold…. you name it, it makes them stuffy, sneezy, and miserable. Thank you sir, but I don’t need your fancy scale to tell me that. I have developed my own allergy meter and all I need is a normal pair of shoes and about eight hours to ‘cook’ the meter. WARNING: KERRY’S ALLERGY METER IS NOT FOR THE FAINT OF HEART. You know when you stuff your feet inside your shoes all day, it creates this little sweat coffin that makes your feet turn into giant odor bombs? Yes you do! Admit it. When you take off your shoes after a long day, even you don’t want to be in the same room with them. Well stinky feet are the key to Kerry‘s allergy meter. Step one: Get home from a long day and remove your shoes. 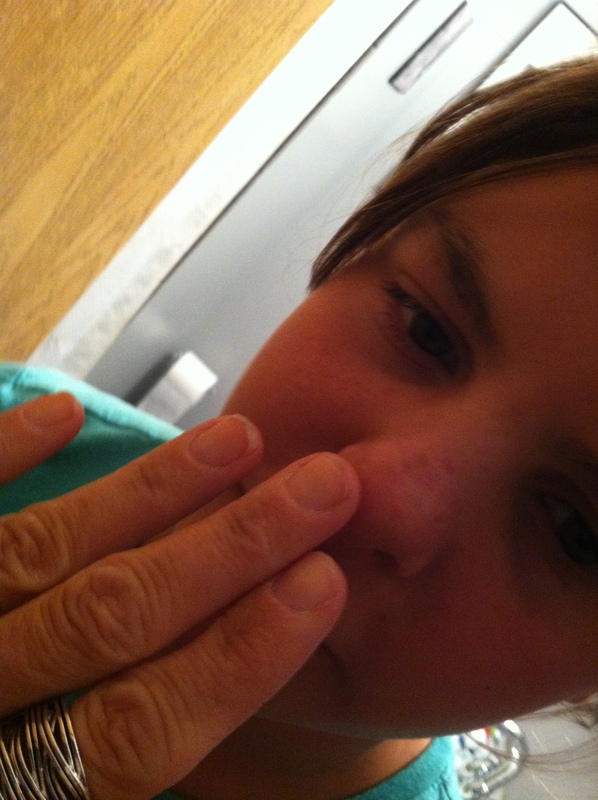 Step two: Rub your fingers in between your toes. Step three: Stick your fingers under the nose of your allergy-suffering loved one. Step four: Ask them what they smell. Step five: When they say “nothing,” proclaim it to be a high pollen count day and load them up with allergy meds. By the time the first of May rolls around every school year, I’m looking for serious motivation to get myself through to the end of the school year. (Ok, in all honesty, that feeling creeps in about Feb 5.) Some of the things that pull me through til the end of the year are thoughts of alarm clock free mornings, sweet memories of my poolside lounge chair and planning for my vegetable garden. I hand-pick my seeds (yes, I said seeds) and buy my bedding trays. I anxiously await as the first little sprouts burst up through the dirt. I count off the days until the farmer’s almanac says that it’s ok to transplant them without fear of frost. Then the glorious day comes when I put them in the earth in my backyard. All that is left is to sit back and wait for my harvest. You know what happens when you have the plant a garden in what turns out to be the hottest and driest summer on record? You get this…. 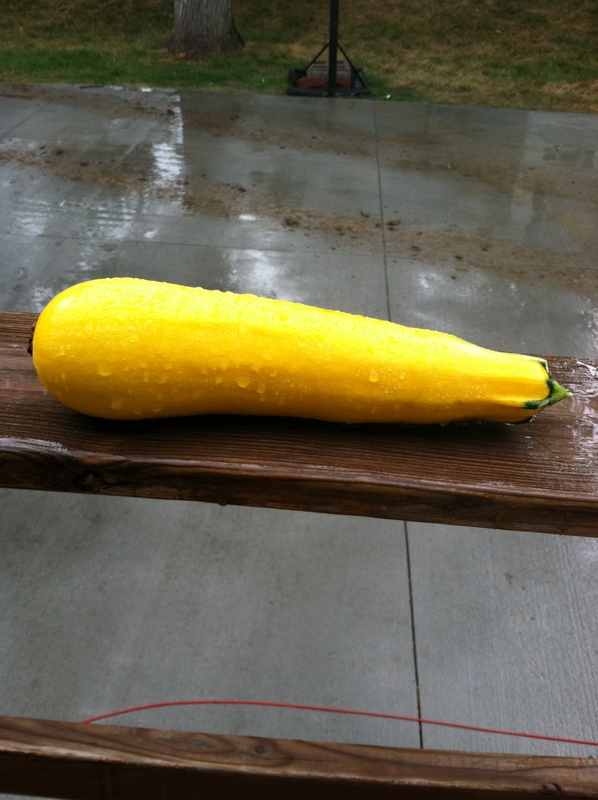 No it’s not a summer squash! It’s actually a zucchini that was picked a little too soon by my daughter who also thought is was a summer squash. Hey, where’s the next picture from my harvest? Oh yeah, that’s right. 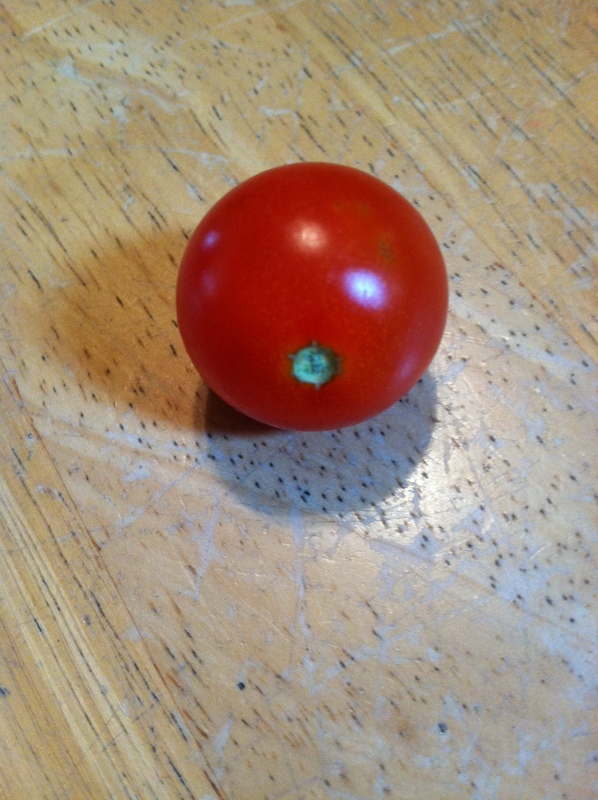 That was both the beginning and end of my garden’s greatness. So we can all agree that the FFA will not be sending me a membership packet anytime soon. Oh well, two out of three ain’t bad! Luckily for my children, they have another week at home before they are back at it. For me it is a week on the edge. They are old enough to be at home, but everyday I walk out the door, I wonder how long it will be before my phone goes off and what ideas they will come up with while we are gone. When we first started leaving the kids home alone, we would get calls all the time. It was always a double-edged sword. We wanted them to call if they really needed to, but we also wanted them also to feel capable enough to not have to call repeatedly for seemingly no reason or just to tattle on each other. By the sixth hour of no call, I was suspicious. They couldn’t possibly be getting along that well, so what were they up to? I finally had contact during hour seven. This was that call…. Me – Yes bud. How’s it going? Trystan – Good. When are you coming home? Me – I will be leaving in about 3o minutes. Why? What’s going on? Trystan – Maddie (the dog) has a fever. Me – Umm…ok…how do you know it? Me – Ummm… how did you take her temperature? Trystan – With the thermometer! Me – OK…where did you put the thermometer? Trystan – Under her arm. When it beeped, it said 99.6. Does she need to go to the doctor? Me – I think she’ll be ok. I’ll be home soon. I’ll check her out and clean the thermometer. I guess it could always be worse. They could’ve put the thermometer somewhere else…..
My son loves to visit the bathroom. No matter where we go, the first thing he must do is check out the facilities. My son also only has one volume. Loud….VERY loud. Thanks bud. I’m sure dad wanted everyone to know that.